When I first accepted the position as president of the Bernardston-Gill-Leyden (BGL) snowmobile club I knew there would be responsibilities. One is doing the best I can to help with all kinds of requests that come from the landowners, state and town agencies, my fellow club officers, club members and all the SAM members that ride the club’s trails. Over the years these requests have come in many forms, phone calls, emails and even notes taped to my snowmobile windshield. As you may imagine, some of the messages go like this: “Where can I get a trail map?” or “Where can I park to get trail access?” Then there are others, such as, “Why don’t you just move the Deer Crossing Ahead sign so the deer won’t use the snowmobile trail?” Ummm, yeah, sorry to tell you the deer can’t read the signs very well. Yes that happened. I asked if he could have just moved it himself. His reply, “I could have but it’s not my job, you’re the president.” I took a moment to collect my politically correct words and told John that actually, you’re right, it is my job but not because I’m the club president, but because I’m a snowmobiler. The point I want to make here is, yes, there are people out there with club titles, presidents, vice presidents, groomers, delegates and more, but we are also snowmobilers. All those people that throughout the entire year go to meetings, run fundraisers and maintain the trails are all unpaid volunteers. My answer is “IF” you have time to ride then you have time to help out. I also remind them that when they bought that SAM pass they became an active member of that club. I always thought “IF” all snowmobilers would remove just one fallen limb or snap a branch out of the way during every ride, the trails would be so much better. Now, I’m not asking all of you to carry chain saws and shovels when you go out. But when you see that stray branch or maybe a rock that the groomer has knocked loose into the trail, something that you can easily and safely remove… do it! 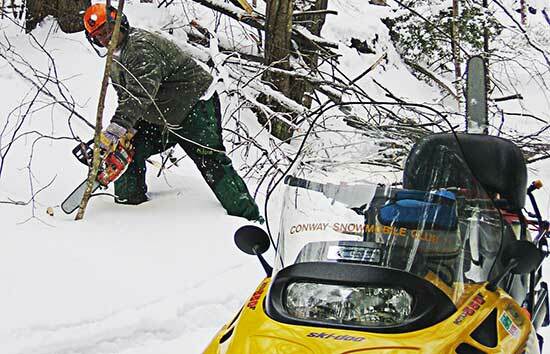 If it’s too much for you to handle and could be a hazard for the next sled, take a moment and stick a small branch in the snow as a warning to the next rider. Then make a call to the local club and let them know its location. Remember by removing that one hazard you could be saving your own, or your friend’s, ski or helmet visor.